The transformation of Brisbane’s riverfront opposite South Bank is now underway, with two barges arriving and work crews starting activities to create a vibrant new public space as part of the $3.6 billion Queen’s Wharf Brisbane development. The two barges are now in place in the foreshore area between the Goodwill Bridge and the government tower at 1 William Street, and will be used to construct a 450 metre above-water pedestrian Mangrove Walk and a new public recreational area called Waterline Park. 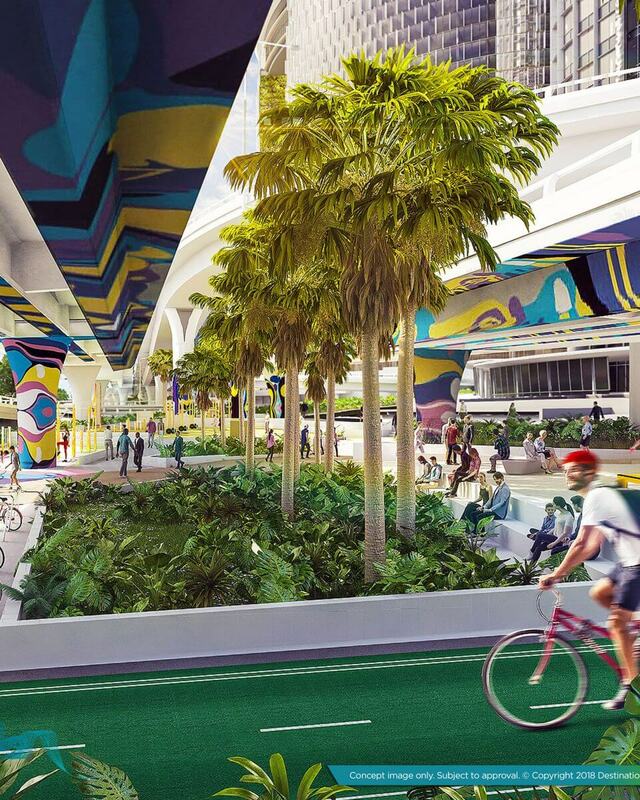 Meanwhile, a colourful art treatment to the underside of the Riverside Expressway is being applied and will provide a gradual reveal of an exciting mural makeover to the roadway columns and overhead areas over the coming weeks. Destination Brisbane Consortium Project Director Simon Crooks said the start of public realm works will provide a highly visible series of activities along the riverfront. “The first works will be to construct temporary river-based work platforms and prune the existing mangroves before we start to build the walkway,” Mr Crooks said. “The Mangrove Walk will provide an alternative path from the Botanic Gardens to Queen’s Wharf, with interpretative heritage, integrated story-telling elements and additional mangrove plantings and a rejuvenation program in the area. “The barges will be used for piling work to construct the walkway structure, followed by crane work to lift pre-constructed sections of the Mangrove Walk into position. Mr Crooks said the river’s edge construction works will occur over the next 12 months to enable Mangrove Walk and Waterline Park to open in the second half of 2019. “These will provide new public areas to enjoy along the riverfront long before the Queen’s Wharf Brisbane development is expected to commence opening in 2022,” Mr Crooks said. “They will be some of the new free public spaces that we are creating across our development, which will ultimately provide the equivalent of 12 football fields of new public realm in Brisbane’s CBD. Mr Crooks said Destination Brisbane Consortium had appointed an independent panel of Queensland art community representatives to select artwork to feature throughout the precinct’s public spaces. “The first of these panel-selected art pieces is the highly colourful mural that is now being applied to the underside of the Riverside Expressway,” Mr Crooks said. “Our panel chose the mural because it uses sub-tropical Queensland colours to portray the tidal changes of the Brisbane River, in a piece designed by Australian artist Alice Lang. the walkway will require 102 piles to enable construction of a pavilion, rest areas and crossovers, and to support a cantilevered bikeway upgrade where original sections are too narrow to accommodate the 3-metre bikeway and separated 2-metre-wide pedestrian path.